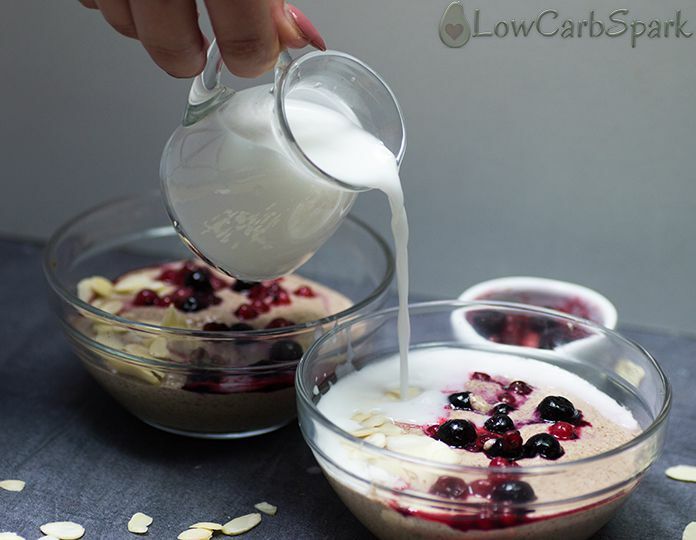 I love having a bowl of keto oatmeal (also called keto noatmeal or low carb porridge) topped with fresh berries and almonds flakes for a perfect low carb breakfast. It’s ready in 5 minutes and super easy to prepare. It’s such an easy and quick recipe, the perfect keto replacement for the classic oatmeal that is high in carbs. 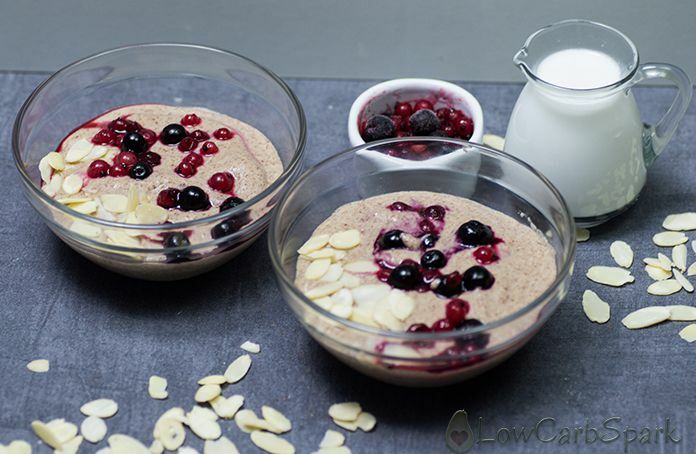 You’ll be surprised that even the texture it’s similar to the classic oatmeal bowl. I discovered this recipe a few months ago, and since then I am making it almost daily. This keto breakfast it’s so filling and the serving size it’s so huge that sometimes I eat half in the morning and use the rest as a low carb snack. The ingredients are super cheap and easy to find. It is also super fast to make. The main ingredients in this recipe are coconut flour, flax meal, and unsweetened coconut milk. In fact, you can use any nut milk you love, but make sure it has no sugars added. The coconut flour will absorb all the liquid, making the noatmeal thick and delicious, while the flax meal will give a tasty nutty flavor. There are two methods to make keto cereal and both of them are super fast. Mix all the ingredients in a saucepan and cook on medium-high heat for about 5 minutes until thickened. Add all the ingredients in a microwave-safe bowl and microwave on high for about 2 minutes or until it gets the desired consistency. 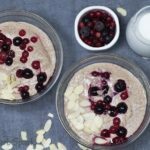 You can make this vegan keto oatmeal, by simply substituting the butter with coconut oil. 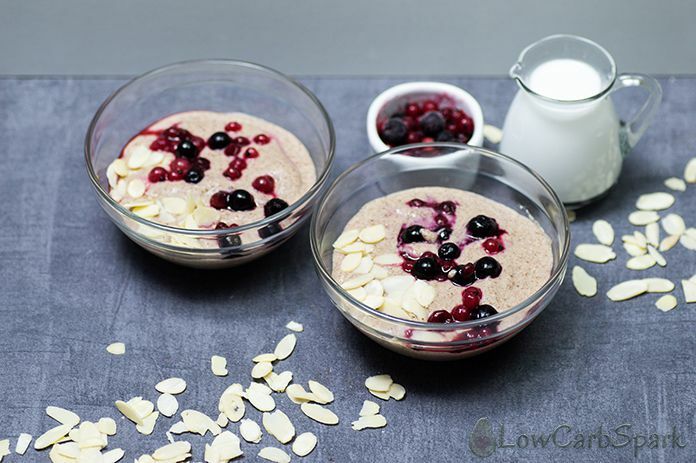 If you are looking for a low-calorie oatmeal, you can leave out the butter and it will still be as good and creamy. On a ketogenic diet, you have to increase the fat intake and this a great way. If you make the recipe I would be delighted to see how your keto oatmeal turned out! After you make the keto oatmeal base, you can add any toppings you want. Make it healthier and nutritious by adding hemp hearts, hemp seeds, chia seeds, almond flakes, MCT oil, protein powder. Making this at night and having it ready in the morning it’s also super helpful for busy days. You can reheat it in the microwave or eat it with extra coconut milk on top. I love the coconut milk touch, it makes me feel like eating real cereal. 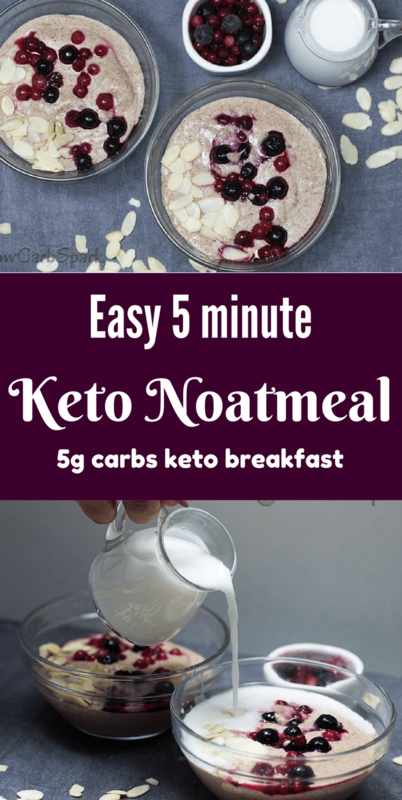 This keto noatmeal is a super easy low carb breakfast recipe that is tasty and very healthy. If you want a quick and satisfying meal in the morning make my favorite bowl of oatmeal that is made with coconut flour and flaxseed meal. Increase your dietary fiber and fat intake. 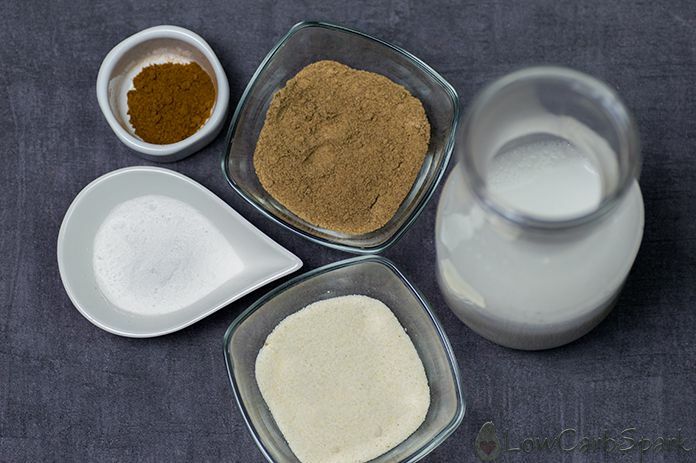 In a saucepan pour the milk, add the coconut flour, flaxseed meal, sweetener, and cinnamon. Combine all the ingredients and place the saucepan over medium-high heat stirring until it starts to thicken. Remove from the heat and let it cool down for a few minutes. Garnish with almond flakes and low carb berries. Enjoy! How many carbs are in the low carb noatmeal? This recipe is packed with lots of healthy dietary fiber that aids digestion and has many health benefits. The daily recommendation for adults is around 25 grams. A serving has almost 5 g net carbs. To find out the net carbs, subtract the dietary fiber from the total carb count. Interesting. I have all these ingredients in the pantry and I love "oatmeal"– it's def worth a try! Can almond flour or quinoa be used instead of coconut flour? Quinoa is not a keto food, so I don't recommend using it. As for the almond flour, you should definitely try to see how much you need to make the noatmeal thicker. I'd say you'll have to use 6-7 tbsp of almond flour instead of the coconut flour. Could this be made with the kind of coconut milk that comes in a can? Maybe with some added water to get the full 2 cups? I'd say that for 2 cups you will need 3-4 tbsp coconut cream. That's how I am using coconut cream to make coconut milk. I made this using 2 cups organic canned coconut milk, undiluted and it was very creamy and good. Wow that great to know. I will try it too soon. Thanks for the idea and I'm really happy you liked the recipe! 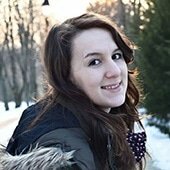 Could I use Kefir instead of coconut milk? You'll have to bring the mixture to a boil and I guess that the kefir will separate. Ahh yes and then lose some of its benefits because of the heat. Thank you! I'm still going to try your recipe! I've tried to eliminate much of the flax from my diet because I've read it lowers testosterone in men. Is there any substitution for the flax? This was absolutely delicious!!! Since I've been doing Keto, I've missed hot cereals, but this really hit the spot! I love Cream of Wheat and Malt O Meal even more than oatmeal and that is what this cereal reminded me of. Delicious, creamy yumminess!!! Thank you!!! That's awesome to hear. I am super happy you enjoyed the recipe! I was looking for a breakfast recipe besides eggs, more like oatmeal. This hit the spot! Thank you! I am so thrilled you found this recipe useful. It's definitely a great choice for a keto breakfast! This was so good. I also felt like it was more of a cream of wheat texture and loved it. I doubled the recipe. It was fast and delish. I added frozen wild blueberries at the end and cut the amount of swerve for my husband who likes things less sweet than I. Sooooo good. Thank you!! I'm super happy you liked it. Thanks for the kind comment! I was dubious about making yet another low carb recipe that might be "so-so" but decided to give it a try since I had all the ingredients on hand from other moderate successes. It was great! I can't wait to try it with blueberries tomorrow. And I'll be looking around the site for more recipes to try. I really happy you liked the recipe. It one of my favorite breakfast and sometimes I am so obsessed with it and I eat oatmeal even for dinner. It's so good with dark chocolate and peanut butter on top. 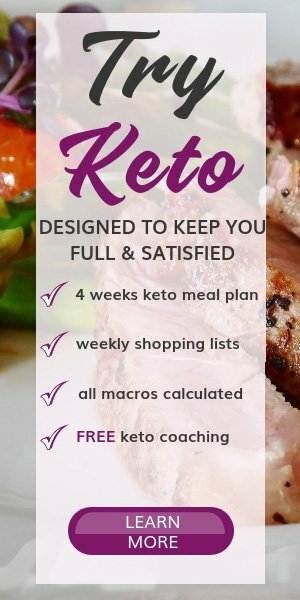 I am new to the Keto diet. I found your website thru Pinterest. I want to thank you for all the work you do to help out us Keto dieters. I'm really hoping this becomes more permanent but I am overwhelmed with all the cooking from scratch. Looking at all the nutritional information on the backs of packages…..I had no idea how much CARBS I was eating. I've made a couple of your recipes already and am so glad I've found a breakfast item that isn't bacon and eggs. With heart disease and high cholesterol, I should not be eating that every day. What is the purpose of the flaxseed meal? Is it more beneficial to have it in the mixture than not? (i don't have any) and if I use unsweetened almond mild, will it affect the carb count too much? Again, thank u so much for your site. I've enjoyed reading and trying your recipes. Well hello and thanks for such a kind message. It really makes me happy that you found inspiration in my recipes. Flaxseed meal is high in omega-3 fatty acids, high in fiber and antioxidants. It also gives a nice flavor to the oatmeal making it taste closer to the classic one. Both coconut flour and flax meal soak well the liquids well making the recipe thick and creamy. As for the milk, you can use any unsweetened one you have on hand. I will try my best to post more and more of my favorite keto recipes. Thank you again for being so kind. ARe the calories correct? Two tablespoons of butter alone are 200 calories. ANd coconut milk is 110 for a 1/4 cup. There are 2 servings of the keto oatmeal and the macros are correct. I added all the macros up for the ingredients/brands that I had here at home, and the macros are much different than the ones listed. I ended up with 41 grams of fat, 6.3 Grams net carbs, and 9 G protein per serving. That makes it 2 servings per recipe. Hoping the husband likes it…this is for him. I manually calculate and recalculate the macros of each recipe. With the products I use, I can assure you that the result is correct. What kind of milk have you used? If you used canned coconut milk I can understand why the fat macro is higher. I used the liquid one. I use canned coconut milk from Trader Joe’s. Amazing! I had been craving oatmeal with the weather recently becoming cooler. This tastes delicious and has the same texture as Malt O’Meal. My husband and I both loved it! It also helps that it is very easy to make. This will become a staple in our weekly routine. Thank you! That's great, Melissa! I am thrilled you both like the recipe. Keep up the good work! Thank you, Chris. I'm super happy you liked the recipe. One of my favorite breakfast at the moment. I used unsweetened almond milk and it was awesome!!! i SPRINKLED a teaspoon of HEMP seeds for ADDITIONAL nutrition and TEXTURE. A great after christmas recovery breakfast!!! It makes a ton. I will use the other half tomorrow. Yummy. quite a treat. I recommend following the recipe for the best results. Swapping the coconut flour with almond flour and adding chia seeds is a great idea, but I’m not sure what measurements you need to use. I just tried it and it’s great. I used half the sweetener (swerve) and added vanilla and a pinch of salt. In this recipe, I use liquid coconut milk.